The Privileges tab allows you to assign permissions to defined users of your Workspace, which controls their ability to view submissions and tabs in the Workspace. When using Privileges, you can limit which submissions and users will have access to view in the Workspace itself. Privileges to view entries only apply to limited users. So if you want to limit someone’s privileges to view data you need to make them a limited user in the People tab. Assignments control users' access to entries in an external portal. Privileges control users' entries not only to entries, but to tabs as well, and privileges apply your WizeHive workspace itself. We can only accommodate 5 users (columns) on one entry in this tab. You can scroll to the right to see the next set of users by pressing the next link or jump ahead by picking a entry. The users here are listed alphabetically by user name so you can find them more easily. Using the Folder and Show options you can select exactly what you want each limited user to see. 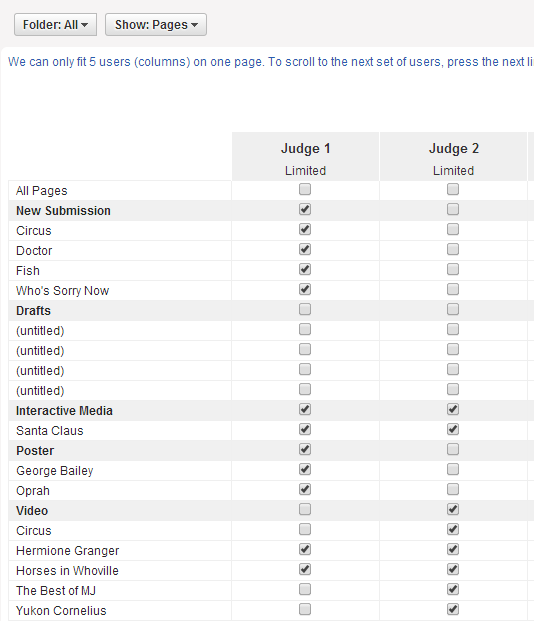 If you Show: Pages, you will be able to check off which entries you want to enable a member to see. This will bring up a chart where across the top are your limited members and along the side are the folders with their corresponding entries. The top checkbox in each column gives you the option to select all entries, thus giving the limited member the privilege to see all entries in the Workspace. The gray horizontal bars in the chart contain each folder, clicking a folder's checkbox permits the limited user to see all of the entries in the given folder. 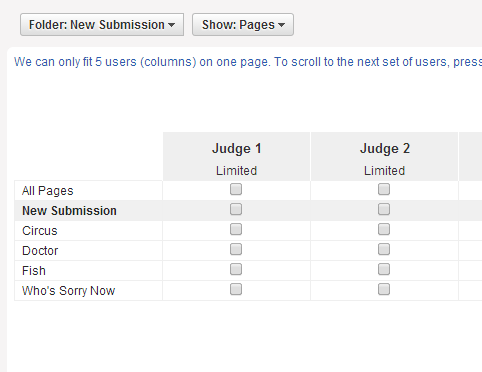 For example, Judge 1 can see all New Submissions because the New Submissions checkbox is checked. (NOTE: Privileges applied to folders ARE dynamic, meaning that if entries continue to enter folders after you have assigned Privileges to those folders, the Privileges will dynamically update and apply to those new entries.) Privileges also enable you to grant privileges on an entry by entry basis, where you can manually select which entries you'd like each limited member to see. 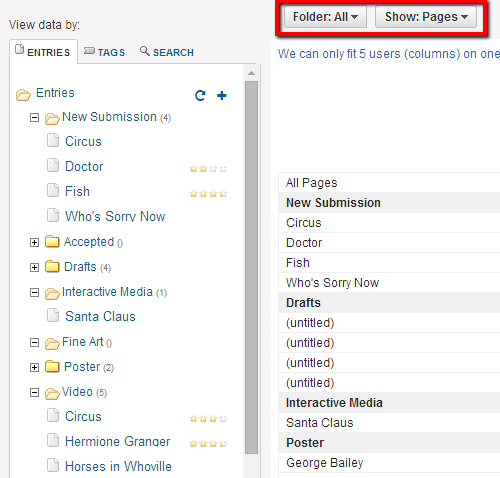 Selecting "Show: Subtabs" enables you to dictate which tabs in the Workspace each member can see. In general, the default settings sufficiently provide members with the correct amount of access, but in special cases the Workspace administrators can go in and select which tabs they would like each member to see. 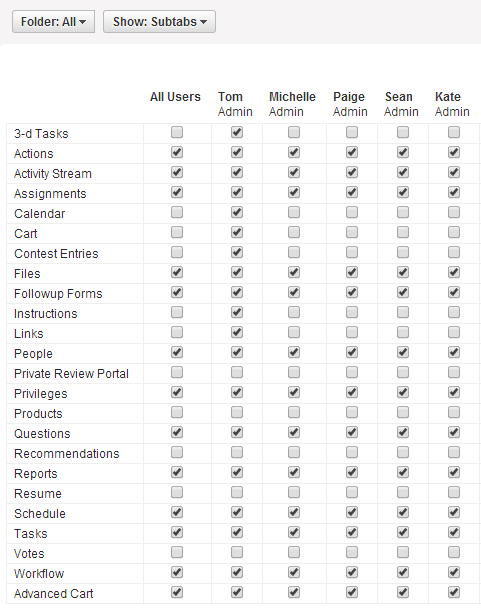 If there is a tab where they would like every member of the Workspace to see, checking the first column ('All Users') will autocheck the checkbox for each member of the Workspace. Limited users are not blocked from adding entries. When they add entries through the back end two things happen. First, by default they become the only limited user that can see their entry. Second, they system needs to know where to put the added entry because they may not be able to see the other folders or entries. This feature then specifies which folder a entries added by this particular limited user should be stored. Here is a real life example. We have a client that uses WizeHive to let recruiting firms log in and upload candidates. Each firm is created as a limited user. Each firm also has a new candidate folder for their users. When they log in, they can see only their candidates. When they create a new candidate (by creating a new entry), they are the only limited user that can see that candidate - the other limited users (other recruiting firms), can’t see this candidate. By specifying the folder in the setup, the administrator can also define where new candidates go. For this same firm, limited users only see their forms. They do not see the activity thread; tasks, or other activity that our client’s employees (who are regular members or administrators) see. When you select to Show: Pages, you can limit the view to only show entries in a specific folder. In the example below, we are only looking at New Submissions.